French president Emmanuel Macron has promised to rebuild Notre-Dame Cathedral in time for the Paris 2024 Olympics, but experts warn it is likely to take at least 10 years. In a televised statement last night, Macron doubled down on his promise to swiftly repair the historic cathedral, which suffered extensive damage in the fire earlier this week. He said it could be rebuilt “even more beautifully” in just five years. However, with the extent of the damage still being assessed, experts have told Dezeen that the process is likely to take far longer. 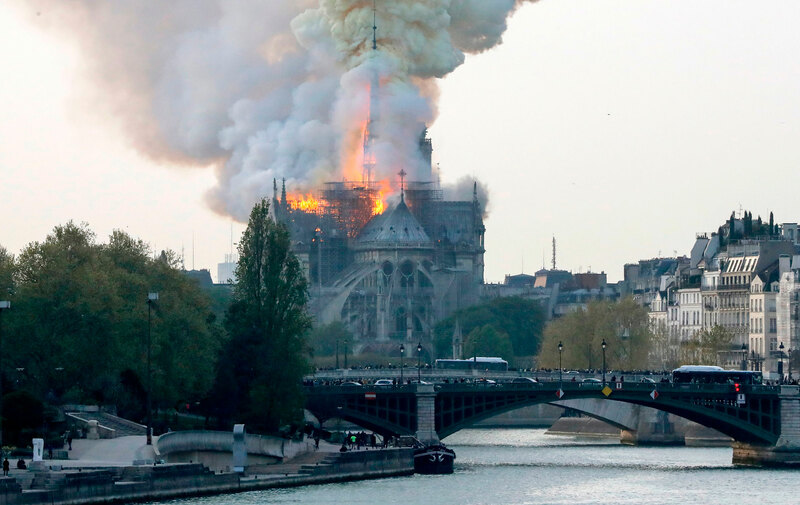 Over €800 million (£694 million) of donations have now been pledged to repair the UNESCO-listed landmark, which was ablaze for nine hours before firefighters were able to get the fire under control. Donors include Apple, L’Oreal and LVMH. The wood and lead roof was largely destroyed, the 90-metre-high spire collapsed and the interior suffered extensive damage. However the main structure survived the blaze largely intact. According to reports, this was a close-run situation. French authorities told the Guardian that the cathedral was “just 15 minutes” away from total destruction. 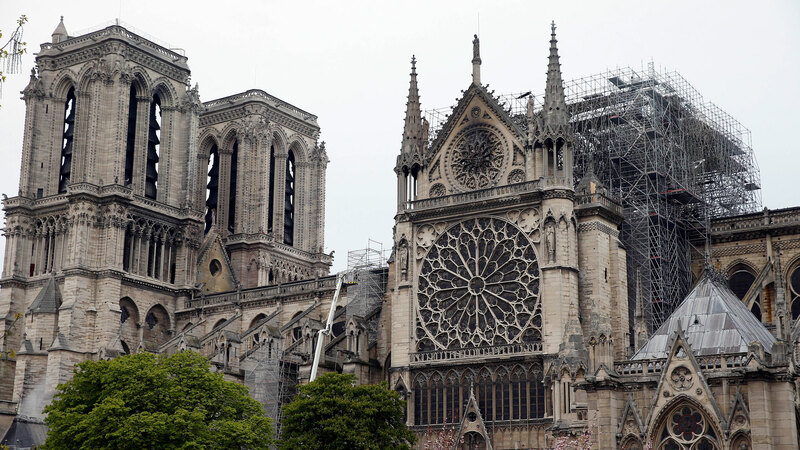 The time now needed to repair Notre-Dame depends on the state of its stone vaults after the fire. While stone is resistant to fire, at very high temperatures it bakes and can become weakened and crumbly. Engineers will need to assess the condition of the stonework and find out if any of the walls have shifted. They may need to install temporary buttresses to shore up the structure. “If they think they can save the vault, and the repairs they need to do it will be relatively minor, then I think I imagine they could probably do it in a few years,” John McNeill, lecturer in medieval architectural history at Oxford University and honorary secretary of the British Archaeological Association. “But otherwise I wouldn’t be at all surprised if it took a decade,” he told Dezeen. Construction first began on the medieval cathedral in 1163, with generations of builders working on the religious building until its completion in 1345. It has undergone several restorations over the century, including significant changes made in the 19th century by architect Eugène Viollet-le-Duc. While the fire damage looks extensive, experts agree that much of the structure will be salvageable. This is in large part due to the design of the vaults of the stone cathedral. The cathedral’s vaulting ceiling, made of limestone ribs webbed with lighter stone between them, acts as a dual fire break. If a fire broke out in the main body of the church it would be harder for it to reach the timber ceiling above and vice versa. In the case of the Notre-Dame fire, the blaze broke out in the roof, which was made of dense lattice of wood including some huge oak beams that dated back to the 12th century. But it didn’t spread to the bell towers. “One of the jobs of a vault is to fireproof it. Although all these burning timbers fell on the vault, by and large the main spans of the vault actually held,” explained McNeill. “If they hadn’t, it would have been complete catastrophe,” he continued. Notre-Dame’s famous stained glass rose windows were also saved from the flames. “It’s a it’s a real testament to just how robust and how well built these things were originally that you could have a massive fire on top of it and there’s actually so little damage to the main face,” said Leslie. “Of course it is going to be an awful lot of effort to clean up and to repair the water damage and to rebuild the fallen vaults,” he added. 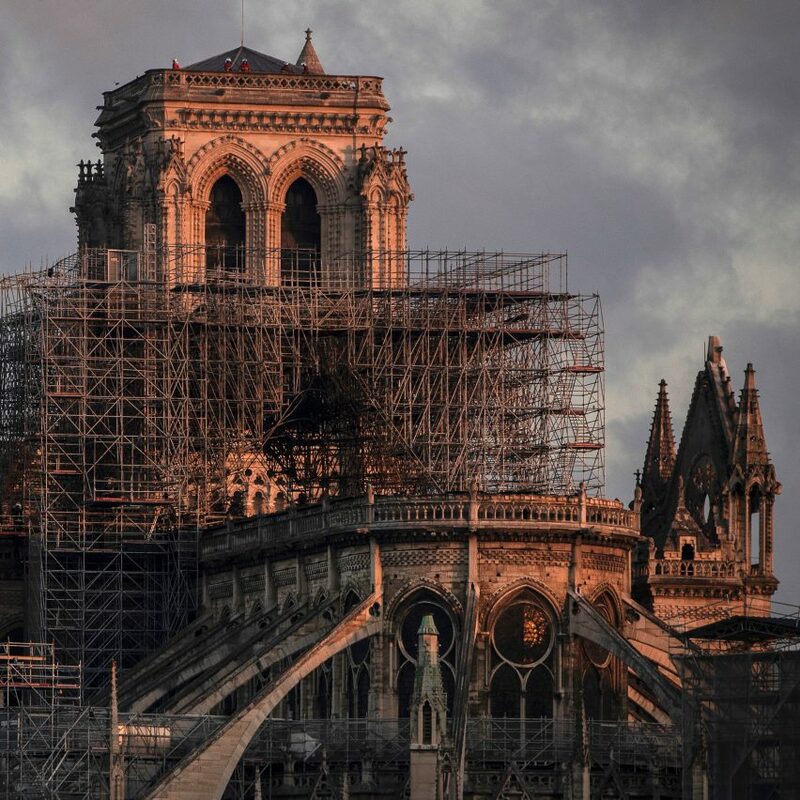 Notre-Dame will need to be covered during restoration work to protect it from the elements. Main image by Dan Kitwood/Getty Images. The post Notre Dame “may take a decade or two” to repair say experts appeared first on Dezeen.